Dragon Wing Begonia is a small annual flowering plant that features dark green leaves and rich red flowers throughout the growing season. It blooms for up to 7 months with virtually no maintenance other than watering. 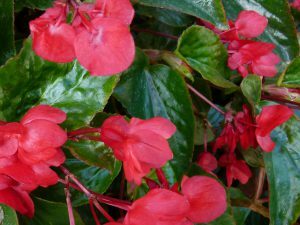 The Begonia exhibits dark green glossy leaves and clusters of red or pink flowers. The leaves grow about 3 inches long and an inch and a half wide. The plant itself grows only 1-2 feet high, so it is an excellent choice as an edge planting along a walk or pathway, or in a container garden or hanging basket. This plant will grow in most light conditions, but it prefers light to medium shade. It can take sun in the morning, but should be protected in the afternoon. It needs a moist but well drained soil enriched with organic matter such as compost. Once established it has a medium water requirement, perhaps once a week. The more sun it receives the more water it will require. Outside of the water requirement, Begonia is a virtually maintenance free annual. Begonias are a commonly used plant within a shade garden. Combined with other shade loving plants, they will bring color to your shady spots all summer long. While it will bloom consistently from spring through the first freeze of fall, begonias are susceptible to cold. They should not be planted until far enough along in spring to be comfortable that the final frost has occurred. If growing from seeds they should be started indoors in a climate controlled environment and not planted outside until the conditions are conducive. The plants will die when the temperature dips to 32 degrees, so it must be planted as an annual that you know will require replacing on a yearly basis.